Mega Sale! 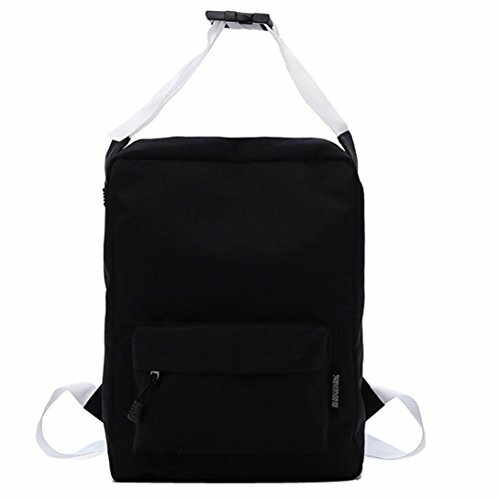 Save 24% on the Stylish Doctor Style Multipurpose School Travel Backpack Daypack for Men Women (Black) by Srogem Bag at Pacs BG. Hurry! Limited time offer. Offer valid only while supplies last.  The bag is perfect in workmanship. The elegant design can show your beautiful temperament. More humanized design for you. Multiple straps change as your like . And it can feel free to change It is very suitable for Wedding , party, ball, daily casual wearing, travel, office occasion. Great present for your friend,your family or yourself.  There is a little smell from the new bag normally, it'll be dispersed through air.  Note:1.All dimensions are measured by hand, there may be 2-3 cm deviations; 2.Due to the difference between different monitors, the picture may not reflect the actual color of the item. Thank you! ❤️❤️❤️ Large Backpack Generous enough to accommodate the magazine, 14" computer, tablet, glasses, wallet, keys, earphone, power bank, cell phone, document and clothes. It will be a perfect school bag for Men, Women, Teens, Boys and Girls, Elementary School, Middle School, High School and College Student. ❤️❤️❤️ Perfect lightweight canvas backpack for working, traveling, school and daily using. Best Wide Open Backpack for traveling, dating, shopping, go to school, office, outdoor activities or casual Life. It will be a perfect school bag for Men, Women, Teens, Boys and Girls, elementary school, middle school, high school and college student. Also as a stylish nappy backpack, baby diaper backpack for dad or mum. ❤️❤️❤️ Perfect Gifts and Lifetime Warranty: This is a great backpack for girls, it's a perfect casual daypack and very suitable for school, outdoor, street and other occasions. ❤️❤️❤️ Lined laptop sleeve holds up to 14" laptop and A4 magazines.Adjustable padded shoulder straps for carrying comfort.The system of reliefing back pressure. If you have any questions about this product by Srogem Bag, contact us by completing and submitting the form below. If you are looking for a specif part number, please include it with your message.